2015 RRTTLC - Octombrie, Vol I, Nr. 1. - Date ASTTLR:CUI 28916696. Cont bancar Ro03 BTRL 0130 1205 E819 63XX, deschis la Banca Transilvania. 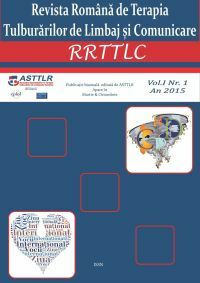 2015 RRTTLC - Octombrie, Vol I, Nr. 1. Bilateral implantation is considered to be an important to be used method for verbal- hearing rehabilitation. The relevance of the bilateral implantation is proven mostly related to language development, but also to the ability to identify the noise source. This article underlines a complex assessment procedure through a case study report, reflecting the fact that language development and hearing perceptive abilities reach a high level of functionality when the child relies on a biaural hearing due to bilateral cochlear implantation. This complex assessment procedure can be considered a valuable starting point in projecting auditory-verbal therapeutic program. This article presents a case study of Laurence-Moon-Bardet-Biedel syndrome. The main objectives of this research are to underline the developmental features and to propose an assessment and intervention approach focused on speech and language therapy in the situation of this rare syndrome. Results demonstrated that an adequate assessment, focused on basic concepts and a specific individualized intervention approach can ensure functional development even if the pathology is complex. The development of literacy for the visually impaired children constitutes the cornerstone of education. Many researchers noted that there are visually impaired children who might have some difficulties in learning to read and write in Braille. That is why, in this article we will try to describe these difficulties. First of all, we will try to define and understand the language difficulties, namely dyslexia and dysgraphia. Secondly, we will try to make a short presentation of the Braille system. We will then go on with the analysis of some types of errors which are frequently observed in case of visually impaired children, but we will also discuss some possible stages of correcting them. Moreover, this article also contains a practical section, in which we will present a case study of a visually impaired girl who studies in the High school for the Visually Impaired Children from Cluj-Napoca. In this case study, we will explain the therapy applied to help her overcome these difficulties. Keywords: dyslexia, dysgraphia, reading difficulties, writing difficulties, visually impairments. This article presents the major aspects regarding telepractice for speech and language therapy. The telepractice is defined according to ASHA, 2015 and the results some researchers made in the telepractice field are presented. The studies presented recommend telepractice in aphasia, apraxia, dysarthria, voice disorders, dysphagia, fluency and voice disorders, language disorders diagnosis, articulation disorders. Caution is needed when working with severe cases. A classification of online therapy services is presented and online sessions are described. The advantages and disadvantages of using online speech and language therapy are discussed. It is important for the therapists to analyze each case with the family and to identify the best intervention possible for that case. The focus of this article is on aphasia, establishing the main assessing and intervention directions after stoke (cerebrovascular accident- CVA). The approach is formulated starting from a theoretical background which states the main causes of aphasia and the main language and speech features in aphasic persons. A case study report reflects in a practical way the specificity of the speech and language therapy approach, underlining the importance of team work in order to ensure relevant progresses in this context. Speech and language communication has different characteristics in hearing impaired persons. This article presents the most important aspects of communication in the hearing impairment context. Specific vowels articulation disorders in children with hearing impairment are discussed. Different methods and procedures used in speech and language therapy are presented: visual aids, dactilems, vocals prolongation, short vocals emission, short vowels emission in open syllables and closed syllables, diphthongs and triphtongs pronunciation. Individual needs are highlighted in a case study report, by choosing the best speech and language therapy methods and procedures when working with persons with hearing impairment. This article presents the importance of the quality of life assessment in speech and language therapy when working with aphasic persons. The terms aphasia and quality of life are defined and the quality of life assessment in aphasia is presented. Nottingham Health Profile is described and used in order to prove the importance of quality life assessment as objective indicator for speech and language therapy relevance in aphasic persons. A case study of a 42 year old female diagnosed with aphasia is presented using Nottingham Health Profile results before intervention and six months after speech and language intervention. The conclusion reveals the importance of including different objectives related to the quality of life in speech and language therapy. Play therapy objectives and information and communication technologies for people with hearing impairment functions are identified in the first part of this article. There are many benefic aspects of using computers during therapeutic approaches when working with persons with hearing impairments. The research presents the results from 108 hearing impaired students evaluated with Verbal Comprehension Probe from Sibiu, non-verbal probe for auditory memory, auditory discrimination and sounds discrimination. During intervention the following programs were used: Detektiv Langohr, Paint Editor and Visual Stimulation Software. Conclusions reflect the improvements the students made in the following areas: digital competences, internet access and flexible perceptive-cognitive styles. Information and communication technologies can be used during the therapeutic activities in the benefit of students with hearing impairment. Keywords: information and communication technologies, play therapy, hearing impairments. This study presents the results of reading fluency ability in five first grade students as measured with PEAFC (Probe for Assessing and Training Reading Fluency). The first evaluation was made in the beginning of the school year, in September 2014, and the second evaluation was seven months later, in April, 2015. The results demonstrate a significant improvement in reading fluency for all the participants. PEAFC helps the teacher or the therapist to monitor the progress and to present the progress the students made to the students and to the parents. The results can be presented in a graphic for a better understanding. Semantic networks are used in enhancing verbal and cognitive development for students, before engaging in the study of a certain topic. They can also be used as a way to summarize the content of a lesson, as a technique of making new associations or of representing new meanings. When teaching literacy to hearing impaired students the most difficult aspects are the understanding the meaning of the words, building sentences and enriching the vocabulary. Erasmus Program financed by European Union represents a real opportunity in empowering life long learning concept. Taking the opportunity for such a financial aid, 50 speech and language therapists gained theoretical and procedural knowledge in works with children with Autism Spectrum Disorder. "The Magic to communicate" coordinated by Youth Movement for Development of the Rural Areas in Bulgaria in partenership with Latvijas Logopēdu Associācija, Asociația Specialiștilor în Terapia Tulburărilor de Limbaj din România, Estonian Logopedists´ Union and Lithuanian Logopedist Association, designed as a summer school, created the framework for better understanding the communication needs and language impairments in ASD. The program also represents a good change to increase professionalism of SLT and to enhance service quality in therapy with ASD.